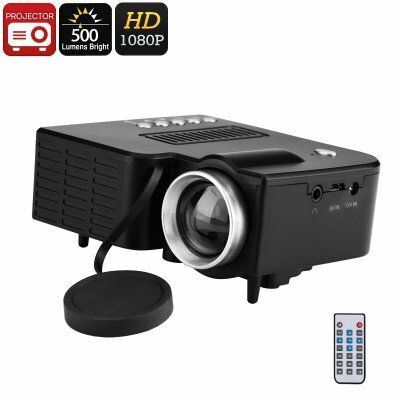 Successfully Added Mini HD Projector - Built-In Speaker, 500 Lumen, 1080p Support, 60-Inch Image Size, Light Weight, AV, USB, SD, HDMI to your Shopping Cart. Let your kids enjoy their movies like never before with this highly affordable HD projector. By supporting 1080p resolution, you’ll be able to project the vast majority of media files onto your wall. This LED projector can be simply hooked up to your PC or laptop and you’ll be all set to enjoy a cinematic experience right from your own living room. It furthermore features a lightweight and highly compact design. Thanks to this, you’ll be able to carry it around wherever you go. From now on, you’ll be able to impress all your loved ones with a stunning visual experience during those upcoming movie nights. With its LED light, this HD projector allows you to turn every dark room into your private cinema. It produces up to 500 Lumen thanks to which it treats you with bright and detailed projections of all your favorite movies. It supports an SD card slot and USB input. This means that you’ll be able to insert your own media without needing to hook up your HD projector to your PC. If you’re looking for a mini projector that can be easily used on the go, this electronic gadget is perfect for you. This mini projector comes with a built-in speaker thanks to which you’ll be able to enjoy media without the need of an external audio device. It furthermore comes with a 3.5mm Audio Jack that lets you watch movies in peace without disturbing others. It supports a large image size up 60-Inch and features a QVGA native resolution. Thanks to this, you’ll truly be able to take the most out of your movie nights and enjoy your favorite films to its absolute most. This HD projector comes with a 12 months warranty, brought to you by the leader in electronic devices as well as wholesale electronic gadgets..